Ancient Indian pictographs (rock paintings) and petroglyphs (symbols carved or pecked on rocks) are claimed by some to be forms of writing for which meanings are known. However, are such claims supported by archaeology or by Native Americans themselves? Mr. Dart illustrates southwestern petroglyphs and pictographs, and discusses how even the same rock art symbol may be interpreted differently from popular, scientific, and modern Native American perspectives. 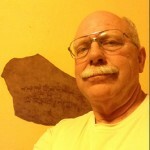 Registered Professional Archaeologist Allen Dart has worked in Arizona and New Mexico since 1975. He is a state cultural resource specialist/archaeologist for the USDA Natural Resources Conservation Service and volunteer director of Tucson’s Old Pueblo Archaeology Center nonprofit organization, which he founded in 1993 to provide educational and scientific programs in archaeology, history, and cultures. Al has received the Arizona Governor’s Award in Public Archaeology, the Arizona Archaeological and Historical Society’s Victor R. Stoner Award, and the Arizona Archaeological Society’s Professional Archaeologist of the Year Award for his efforts to bring archaeology and history to the public.